Originally Published in The Saratogain: Sunday, February 20, 2011. Click Here To Read Online. BALLSTON SPA – Joe Mazurkivich starts his day early at his paid job at the Ballston Spa Public Library every Monday, Wednesday and Friday. He usually works from 8:30 to 10 a.m.
Mazurkivich preps the library for opening, performing a variety of tasks like mopping the floors and taking out the recycling. “Fridays are Joe’s coffee days,” Linda Sherman says. Sherman works for the Saratoga Springs day habilitation branch of Saratoga Bridges, helping people with disabilities integrate into community life. Among her duties is accompanying Mazurkivich and driving him to various destinations throughout the day. This morning Mazurkivich opts for Cumberland Farms over Dunkin’ Donuts. After much deliberation, he chooses a mix of Coke Zero and Mug Root Beer along with a Hostess Snowball for a snack. Next up is Mazurkivich’s favorite part of the day, volunteering at the Saratoga County Animal Shelter. After dropping off the recycling, Mazurkivich and Sherman head inside where the shelter staff and volunteers greet them in a chorus of warm hellos. 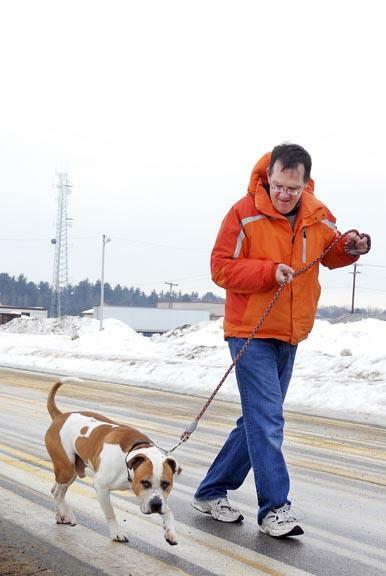 Today Mazurkivich is walking Scooby-Doo, a 9-year-old pitbull surrendered by her owners Dec. 8. 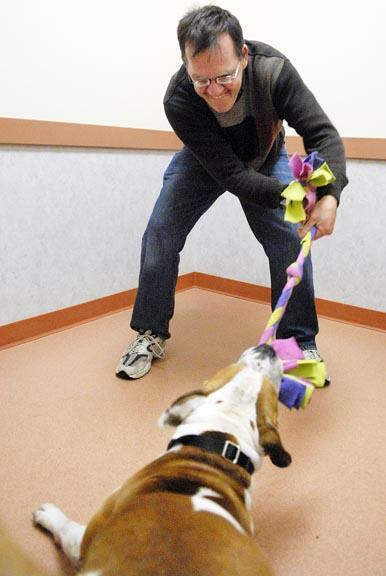 Back inside, Sherman and Mazurkivich gather toys and dog treats and head to The Dog House, one of the shelter’s new playrooms. Mazurkivich is in his element. Sitting on the floor, he plays tug-of-war with Scooby while occasionally stopping to soak up some doggy kisses and reward the pooch with a biscuit for good behavior. Shelter employee Tracy Dussault describes Scooby’s transformation: “He was really bad; he wouldn’t even go into his cage.” But after a couple of months working with Mazurkivich, she said, the dog has done a complete 180. Mazurkivich has two large dogs named Wilson and Murphy back at home in Clifton Park. Last year, Mazurkivich and Sherman fell in love with one of the pups, a border collie/chow mix named Gracie whom Sherman ended up adopting. After a brief stop to pet the cats in the Lion’s Den, the pair says their goodbyes and heads back to day hab for lunch. On other days, Mazurkivich takes art classes and volunteers for Meals On Wheels, but this afternoon he will head to the YMCA with friends to play basketball. In 2005, Mazurkivich received Saratoga Bridges’ ninth annual “Lifetime Achievement Award” at the organization’s gala at the Hall of Springs. He was chosen for a number of reasons, but predominantly because he had made such significant progress in his life and in his engagement with the community. “He’s involved with so much,” Sherman says. By noon, Mazurkivich has already logged hours at the library, volunteered at the shelter and spent time in the classroom. He plops into a chair. “I worked hard today,” Mazurkivich exclaims with a smile.